I tweeted last month that I'd be spending 8 weeks attached to a pedometer. It's all part of a work thing - an 8 week global fitness challenge - in order to raise fitness levels around the offices worldwide, or at the very least raise awareness of the fitness levels of every one of us. While this challenge is specific to my work, it turns out there's another similar thing going on - the Global Corporate Challenge - which is for any company willing to participate (and to pay), and it's for a whopping 16 weeks worth of time. With these 2 events going on at the same time, I'm not the only one of my friends spending X or Y amount of weeks tethered to a pedometer. So last week, my friend Claire asked me if I wanted to join her for a simple 8km walk around the city. Eager to boost my step count, I said yes, and shortly after work we were both walking along the harbour roads of our city to a 4km half-way marker, and back again. 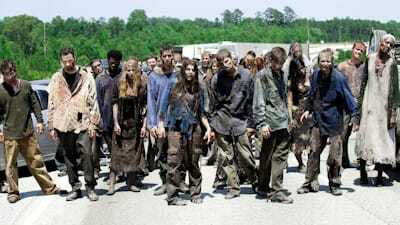 I put 'walking' into Google Image search, and it suggested 'walking dead'. I couldn't pass it up. Having lived almost 5 years in the city, I've long become used to the general 'buzz' of the city - there's always something happening outside such that it's never really quiet around here. Where I live, I'm near an on-ramp to the motorway, so whenever there's an ambulance or police car racing to get to the suburbs, I'm gonna hear it. Friday or Saturday night, there's likely to be a party in one of the houses nearby. Even in the dead of night, if there isn't the howling wind to keep me company, then I can hear the low-but-constant sound of either my building's air circulation unit, or a neighbouring one. The sounds of civilization, permeating my ears 24/7, and I've since learned to tune it out. It got a bit quiet as we walked away from the city centre, but with the configuration of the hills and the occasional car or plane, some kind of sound would eventually make its way into my ears. As we turned a corner though, a corner that would put a hill between ourselves and the city skyline, several things fell into place such that I experienced what must have been my first taste of real silence in the city. There were no cars on the road for hundreds of metres in either direction, no aircraft above us, and all the sounds that marked the general hum of the city were blocked by a huge lump of earth. Claire was talking at that moment, but I slowed-down my pace and interrupted her. "Claire... do you hear that?" We were both quiet for a moment, and just before the silence became too uncanny, a wave from the harbour crashed upon the rocks beside the road we walked along, before giving way to the silence once again. And it was one of the most beautiful things I have ever heard.